Seventeen-year-old Snow has spent the majority of her life within the walls of the Whittaker Institute, a high security mental hospital in upstate New York. Deep down, she knows she’s not crazy and doesn’t belong there. When she meets a mysterious, handsome new orderly and dreams about a strange twisted tree she realizes she must escape and figure out who she really is. Using her trusting friend Bale as a distraction, Snow breaks free and races into the nearby woods. Suddenly, everything isn’t what it seems, the line between reality and fantasy begins to blur, and she finds herself in icy Algid–her true home–with witches, thieves, and a strangely alluring boy named Kai, none of whom she’s sure she can trust. 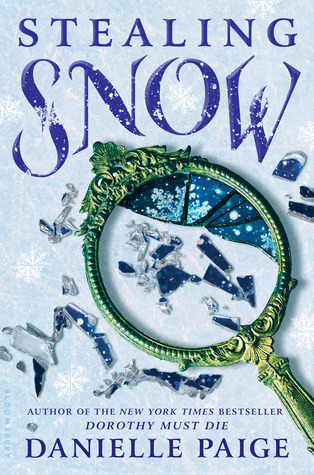 As secret after secret is revealed, Snow discovers that she is on the run from a royal lineage she’s destined to inherit, a father more powerful and ruthless than she could have imagined, and choices of the heart that could change the fate of everything…including Snow’s return to the world she once knew. Was it totally weird reading a book about snow in August? Yes. Did I love every second and every page? Y-E-S. I am a huge fan of Danielle’s Dorothy Must Die series (book 4 comes out on my birthday HOLLA ❤️🎉 ) so I don’t think anybody was surprised when I was obnoxiously excited about this book. I’m fully aboard the retelling train so this was a must-read. Although I’d read the synopsis, by the time I actually got around to reading the book I totally forgot that it initially starts in “our” world. Once I adjusted to that, however, there was no turning back. I was sucked fully into Snow’s world, her struggles, and her own personal turmoil. Although I did wish for a little more consistent doses of action throughout, the book moved well through the story and I was never bored; I was just in the mood for a lot of action. I totally also fell into the trap of wanting the two magical boys Snow meets as book boyfriends. Seriously, some YA characters have ALL THE LUCK. I want a swoony, magical male too! I found all the characters very compelling actually. I like when my feelings about some of the people within the story are mixed. It keeps things interesting and makes me pay even more attention to just the slightest things. It gets my BS sensors up and running in hopes of sniffing out the people you can’t actually trust or the bad guys that will turn out good long before the reveals. I also loved the grey areas of morality, loyalty, rules, etc. explored in Stealing Snow. I may not *like* what a character does but it’s always interesting if I can sympathize or at least understand their motives. The manifestation of magic was great in Stealing Snow. Yes, she wields a powered based around snow, but it’s not all about making snow or blizzards appear and just chucking it at people willy nilly. She can do a ton of really cool things with her snow (and others with magic in general) and I’m lowkey really jealous of all of them. Ever since Harry Potter, all I’ve wanted is some sort of magical power and these YA fantasies just keep feeding my desperate pleas for that blessing. I was slightly confused with the layout of the land which was the biggest downfall for me but I’m holding out hope for a gorgeous map. I will study that map way better than I looked at anything in Grade 9 geography (and I was a nerd, so I actually studied hard). Please, give me a pretty map 😀 ! Once again, Danielle has brought me a book that I devoured and immediately needed the next installment of. I do still have the novellas to read that will tide me over for about .0001 seconds before I’m whining about needing book 2 again. While I’m at it, consider this my daily whining for The End of Oz. Seriously, I’ve traded cake-batter cookies for books in the past so send me a DM, Danielle, if we can work out a trade 😂😁😉!